Let's start out with some color, shall we? For obvious reasons, I could not resist purchasing this from here. I started cutting two packs of solid charms from Lecien. Such a pretty pile of trimmings. It ultimately turned into a quilt called Semaphore. It was designed by Elizabeth and is perfect for charm packs, don't you think? I'm sure glad I took a picture of my engagement and wedding ring. 116 weeks ago when someone started an Instagram hashtag called #showmeyourweddingring, or something like that. A couple of weeks ago, one of the little marquis diamonds fell out and I never could find it. Mark and I had been talking about changing out the marquis ring guard to something else. While my original diamond is small, it is really high quality, and the little diamonds on either side just never sparkled. The jeweler told me that it is because of their shape, not because they are inferior, so that was good information. But then I lost one. So we traded it in and now my ring looks like this. Isn't it pretty? My original diamond even looks larger. Yay for nearly 43 years of marriage! I had the greatest afternoon on Tuesday because I was able to spend a couple of hours visiting with Stephanie (@stephiepeterson). She was in California on business, and she was only 1 1/2 hours away. It was wonderful visiting. But the time was waaaay too short! Good thing we will see each other in Minnesota in July. Do you know anything about the name of the street you live on? A few months ago, there was an article in the paper about some local women who have been friends for decades. The maiden name of one of them was Sample, and the article mentioned that "the Sample family has a long cattle ranching history...." I'm pretty sure that's the origin of the street we live on. If not, I'm going with it anyway. And I'm glad I took this picture because we have lived in this house for nearly 27 years and I can never remember the name of the street that t-bones into our street less than a block away. I definitely MUST make this (sorry for the glare in the middle...but you get the idea). I can't remember where I saw this. Sometimes we tend to take care of everyone around us, but not ourselves. Keep this handy. Read it often. I love your cuff and the new rings are beautiful! Nice quilt too. Yep, that is one cool cuff. Love your ring story. 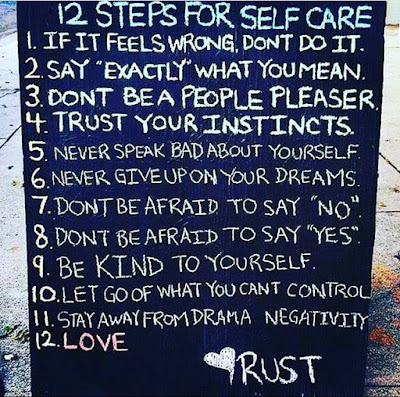 I'm typing out the self care sayings - good stuff. Your right looks great! Glad you still have a photo of the old version. And I think you are right about the origin of your street name - especially since the adjoining street is Angus (aka - a type of cattle). My street is Holly drive and it's because there are Holly plants everywhere. I hesitate to call them bushes because some are as tall as the houses! That is the perfect cuff for you. The new update on your rings is beautiful. That cuff is so perfect. Your ring is very pretty too. I think one of my side diamonds is loose. Need to get that fixed before I loose it. They are from my Mom's engagement ring so special. Well, I certainly learned one thing: I do not take care of myself. At all! I should read the list daily! Your ring is stunning and the cuff, well, I want my own! Thanks for hosting Really Random Thursday! That is one great bracelet--glad you snapped it up! 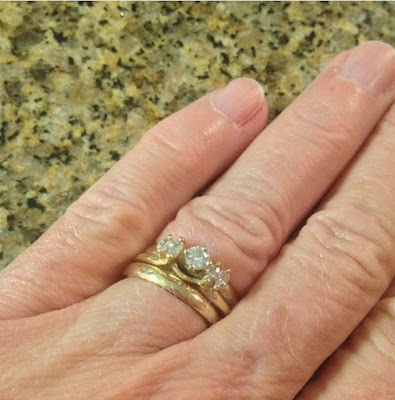 Your wedding set is beautiful--so smart to trade it out for an updated one. It really does sparkle! Love all the things on the chalkboard list, as well as that perpetual calendar. However, where would you hang it? And what would we do with our very cool Get To Work Book calendars? But I love all the color chips. Fun post! I LOVE your bracelet and your rings are very pretty. You've got the bling thing goin on! Your ring is so pretty, Cindy. The make-over of it is gorgeous. My engagement ring diamond broke... yes, I knocked it just right and a section of the main diamond slivered away. That was the reason for getting a new diamond that is bigger than what we could afford when we were 19 and 20 years old. Neat about your street name. We're on French Oak, and it's one of the reasons we "knew" we'd found the right house... being wine-drinkers and cork dorks, as we are. The paint chip calendar is such a neat idea. If only I had more wall space. At last count, I have 19 quilts hanging on the walls!